1741 leased to the impresario, Josef Selliers by Emperess Maria Theresia. Subsequently completely rebuilt after unsuccesful attempts to convert the "Ballhaus" to a theatre proper. 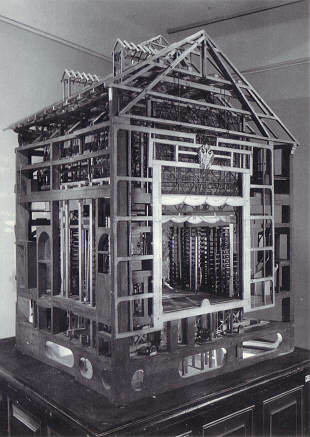 1748 opened as "Königliches Theater nächst der Burg". 1756 rebuilding and extension, installation of a new façade at the rear of the stagehouse. 1776 renamed "Teutsches Nationaltheater nächst der Burg". 1794 renamed "K. K. Hoftheater nächst der Burg". 1848 renamed "K. K. Hof- und Nationaltheater". 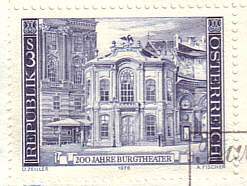 1852 renamed "K. K. Hofburgtheater". 1125 seats. 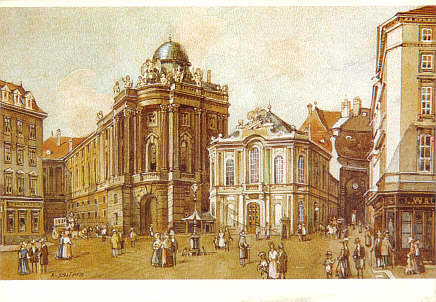 Demolished 1888 in favour of the "Michaelertrakt" extension of the Hofburg palace. 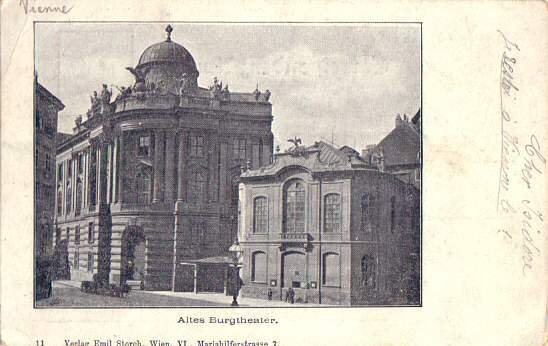 Reverse Text: "Alt Wien - Das Alte Burgtheater mit der Winterreitschule am Michaelerplatz um 1880. Aquarell von Rudolf Schima." 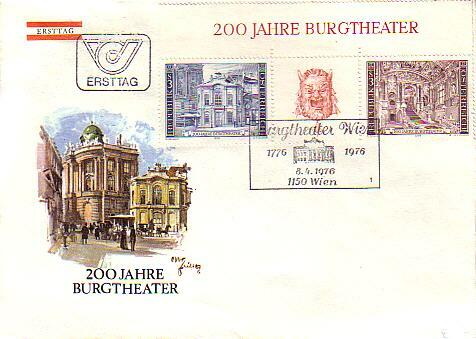 Front Text: "200 Jahre Burgtheater"
Postmark: "Burgtheater Wien - 1776 - 1976 - 8.4.1976 - 1150 Wien"
Reverse Text: "Architekturmodell des Alten Burgtheaters am Michaelerplatz, Wien 1, Rekonstruktion"